This notice outlines our approach to personal data privacy and provides you with information about the data we collect and process about you, why we process your information, with whom we share your information and outlines your rights with respect to your information. To change your consent, simply check or un-check the box below or use the Cookie Settings tab at the bottom of the site. Bed and Breakfast Homes of Ireland CLG trading as B&B Ireland located on the Belleek Rd, Ballyshannon, Co. Donegal is an organisation that promotes and sells the B&B product on behalf of our B&B properties on this website. WHO IS RESPONSIBLE FOR THE PROCESSING OF PERSONAL DATA IN B&B IRELAND? B&B Ireland controls the processing of personal data as described in this Privacy Notice. Contact Data includes your address, email address and telephone number/mobile number. Transaction Data includes details of products/services you have purchased from B&B Ireland. Profile Data includes login details to your B&B Ireland account where you can store your bookings. Financial Data includes your payment details, during the booking process, you will be asked for a credit card number to secure the booking. Communications Data includes your contact details for receiving communication relating to your B&B booking, your B&B reviews and any other correspondence relating to your reservations. Marketing Data includes the collection of your email address for B&B Ireland to send you promotional material. Please note, that you will need provide consent, to receive this information. Cookie Data includes tracking technologies in order to analyse traffic and for advertisement purposes. Please note, that you will need provide consent, to receive this information. Other Personal Information including CCTV at the B&B Ireland head office in Ballyshannon, telephone recordings and information relating to you exercising your data rights. B&B Ireland also collect, use and share aggregated data such as statistical or demographic data. Aggregated Data may be derived from your personal data but is not considered personal data in law as this data does not directly or indirectly reveal your identity. If the required personal data is not provided, B&B Ireland cannot finalise the reservation, nor can we provide customer service. WHY DOES B&B IRELAND COLLECT AND USE YOUR DATA? The main reason why B&B Ireland collect and use your personal data is to administer your online B&B reservations. B&B Ireland relies on the legal basis that the processing of the personal data is necessary for the performance of a contract, specifically to finalise and administer your reservation. B&B Ireland have set out in a table format, a description of all the ways your personal data is used and which of the legal bases we rely on to do so. B&B Ireland have also identified what our legitimate interests are where appropriate. In order to complete your B&B reservation, we transfer relevant reservation details to the B&B provider you have booked. This can include your name, contact details, the names of the guests travelling with you and any preferences or other information you specified when you made your reservation. It is essential that we deliver your details to the B&B owners, so they are informed of your arrival. The B&B owner may wish to contact you via e-mail or telephone should they have any queries e.g. approximate arrival time. Credit card details will not be provided to the B&B owners. These details are held on a secure and encrypted system by an external provider. Third-party service providers: We use service providers to process your personal data on our behalf. This processing is for several purposes, such as marketing, finance, IT and management. We use marketing/advertising providers in order to process data. We use IT service providers in order to store and process personal data. We use payment providers in order to process payments. From time to time, we also use third party professionals such as accountants, solicitors, consultants and advisors. Where these companies/individuals have access to personal information, they are subject to appropriate contracts. Links to other websites: Our site may, from time to time, contain links to and from other websites. If you follow a link to any of those websites, please note that those websites have their own privacy policies and that we do not accept any responsibility or liability for those policies. Please check those policies before you submit any personal data to those websites. B&B Ireland store data on a secure content management system. The data that is stored on the content management system is related to your B&B reservations. This information is stored on the system, in order to fulfil our contractual agreement and to administer the booking process. 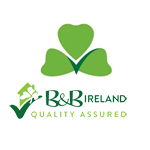 B&B Ireland use advertising partners that are located in Countries outside the EU. We transfer data for marketing purposes to providers in the USA, such as cookie data and email marketing data which has been provided to us on your consent. We use appropriate business systems and procedures to protect and safeguard the personal data you give us. B&B Ireland is committed to protecting the security of your personal information. We use a variety of security technologies and procedures to help protect your personal information from unauthorized access, use, or disclosure. For example, we store the personal information you provide on computer systems with limited access, that are located in secure controlled facilities. When you transmit highly confidential information (such as a credit card number) over the Internet, we protect it through Thawte 128bit secure sockets layer (SSL) encryption technology. B&B Ireland will only retain your personal data for as long as necessary to fulfil the purposes we collected it for, including for the purposes of satisfying any legal, accounting, or reporting requirements (seven years).To determine the appropriate retention period for personal data, we consider the amount, nature, and sensitivity of the personal data, the potential risk of harm from unauthorised use or disclosure of your personal data, the purposes for which we process your personal data and whether we can achieve those purposes through other means, and the applicable legal requirements. You have certain rights under data protection laws in relation to your personal data. These rights are outlined below. If you wish to exercise any of the rights set out below, please contact us by phone, email or by post. Request access to your personal data (commonly known as a “data subject access request”). This enables you to receive a copy of the personal data we hold about you together with other information about our processing of that data and to check that we are lawfully processing it. Request correction of the personal data that we hold about you. This enables you to have any inaccurate data we hold about you corrected, or if we have incomplete information, you may request that we update that we update the information so that it is complete, though we may need to verify the accuracy of the new data you provide to us. Request erasure of your personal data, also known as the right to be forgotten. This enables you to ask us to delete or remove personal data where there is no good reason for us continuing to process it. We try to respond to all requests within one month. Occasionally it may take us longer than a month if your request is particularly complex or you have made a number of requests. In this case, we will notify you and explain the reason why. This privacy notice will be reviewed, and we reserve the right to change this privacy notice from time to time. If we make any changes, we will post those changes here.